Geriann Brandt, director of the criminal justice/criminology program and assistant professor, admits that when she first learned her courses would be transformed for online learning, she was less than enthusiastic—even though her on-ground program would remain strong and intact. Williams is director of learning design and development. Childers is a senior learning designer. Along with an expansive team of instructional designers and technical developers, they work closely with faculty across academic disciplines to create the most robust online programs in the United States. The first of Brandt’s classes, Introduction to Criminal Justice and Multicultural Policing, debuted online this fall. A course titled Introduction to Criminal Investigations will follow in Spring 2019. Childers spent hours observing Brandt’s teaching style, and they had numerous conversations as first steps in transforming Brandt’s courses for online students. The goal is to engage students in the best ways possible, using rich visualizations and immersive virtual experiences. Childers has helped develop more than 100 online courses.“It’s not only what students can see and hear, but we need to emulate some of those tactile and sensory experiences. We can do lots of things cognitively and emotionally with audio and video to engage students in new ways,” she says. Brandt had 13 years of law enforcement experience with the St. Louis County Police Department, seven of which were in the Uniform Patrol Division, before joining the Maryville faculty 16 years ago. Williams and Childers describe her as a dynamic educator who brings enormous expertise and passion to what she teaches. In the on-ground version of Criminal Investigations, Brandt stages a crime scene on Maryville property to teach students about finding and handling evidence. It’s about as hands-on a class as any, so bringing it online is challenging. Brandt says the benefits of transforming classes to an online environment are enormous—and she’s grateful for the opportunity. In addition to growing her program and being inspired to think more creatively, in the process, she’s learning about new technology and getting to know her students better. “Developing online classes for Maryville allows me to view my on-ground teaching with a critical eye—meaning I look through the lens of online learning to assess if my content and concepts are clear and concise,” Brandt says. She checks in with her online students daily, responding to questions, answering emails, grading and facilitating discussions. The new environment is invigorating and provides welcome perspective, she says. “I have students stretching from the states of Washington to Texas to Missouri. Having a wide variety of backgrounds, income-levels and careers brings new viewpoints to our discussions,” Brandt says. This fall, Maryville launched 10 new undergraduate online programs. Students can earn a degree online in a wide range of fields, from psychology to communications and business administration to health management. “It’s about providing educational opportunities to students who might not otherwise have them,” says Williams. When faculty experts share their best practices gathered over time with learning designers, she says, the end result is more innovative, engaging and successful for students. 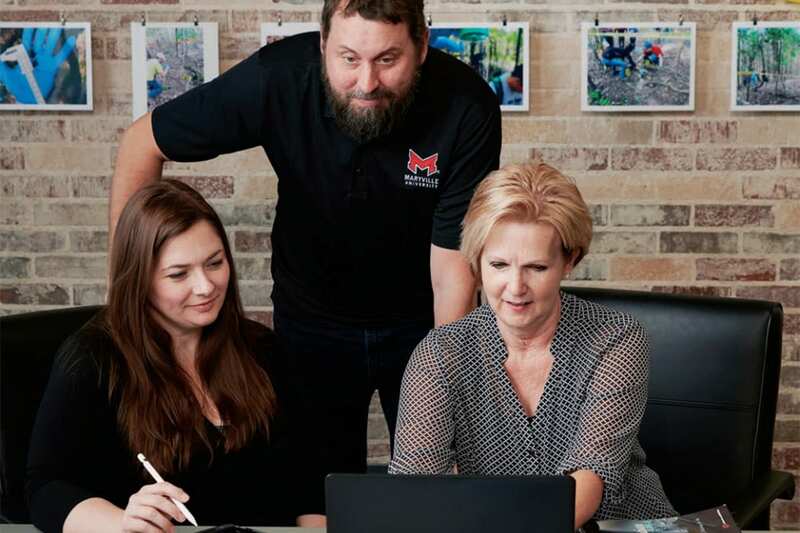 “Our partnership with faculty throughout the online teaching and learning process is a powerful differentiator for Maryville University,” Williams says.